The North Chinese Leopard is a subspecies of leopard known by the scientific name Panthera pardus japonensis It is endangered and quite rare with luxurious thick fur. It is and graceful and wonderfully creation by God. 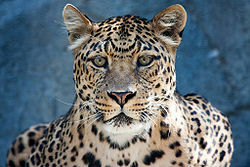 The North Chinese Leopard is a endangered animal and only 2,500 are left in the wild. The leopard lives just south of the Amur leopard. The North Chinese Leopard also has a nice fur coat the leopard also has a thick coat because it lives in a cooler climate. The leopard also has the length of 68-78 inches with a tail of 36-44 inches and weighs about 140-160 pounds and females weigh about one third less. The North Chinese Leopard mates in the months January through February. After the gestation period of 105-110 days, 2 to 4 young. Cubs weigh about one pound after birth and cannot see. After 10 days cubs are strong enough to open there eyes and see. They stay with their mother until 20-24 months old. This page was last modified on 14 March 2010, at 16:20.